Although bargain hunters are awaiting the Boxing Day sales with eager anticipation, Ties Planet have done it again with another great offer. Many gifts are now slashed to half price. This represents unbelievable value, especially as original prices at TiesPlanet.com are the lowest around anyway. 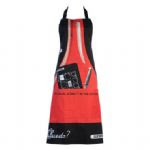 One example is this Cluedo Miss Scarlet Apron. Including postage you could be paying well over £20 for this item elsewhere. With Ties Planet the price is just £7.49, down from £14.99. So if you are investigating the best sale this year, we already know whodunnit. Ties Planet have done it, on the web, with the keyboard! Case solved!